Every salad needs something cheesy guys. It just does. 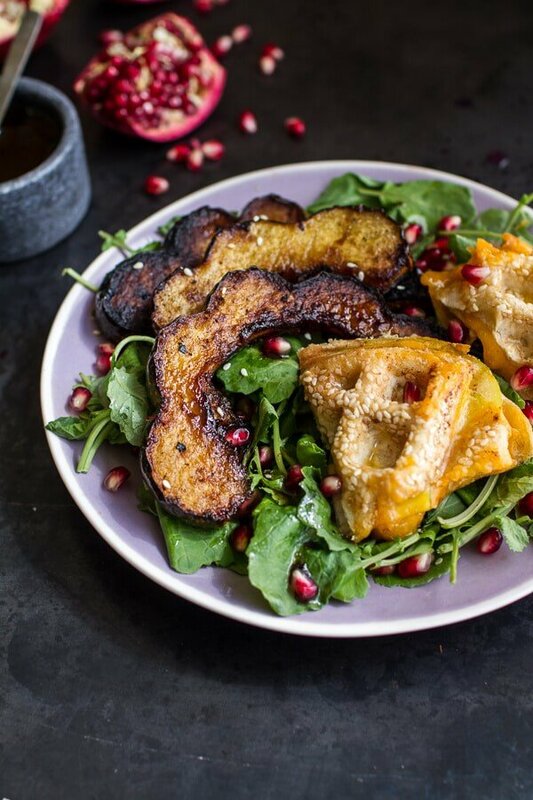 I think so anyway, and this Miso Roasted Acorn Squash + Pomegranate Salad is no exception. At first, I was not sure if miso and cheese would go together, but let me tell you, they do. And so deliciously well. This salad may seem crazy from the title, and look simple from the pictures, but really it’s a mix of both. It’s crazy because those waffled grilled cheeses are the best thing to ever happen to a salad. The salad is simple. 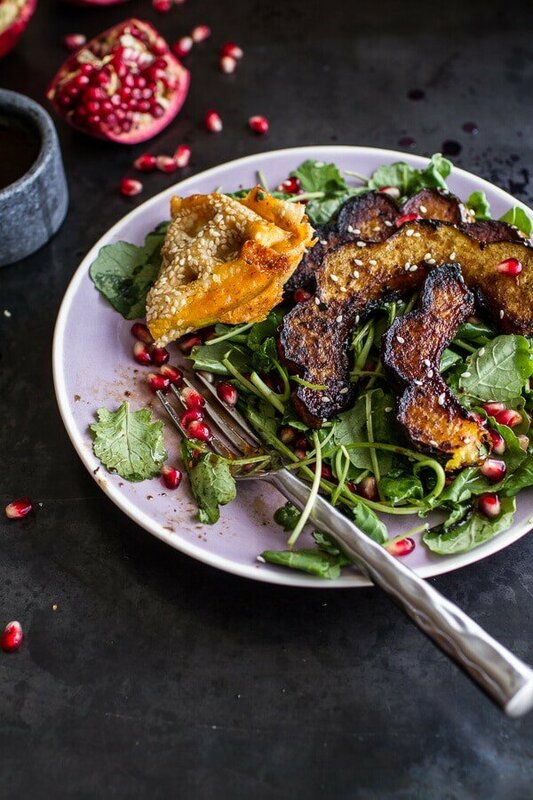 It’s actually just an acorn squash and pomegranate salad. There’s not a million ingredients, just a handful, and it’s pretty quick to make too. I am aware that salad and grilled cheese are not usually put together, but I do not have the ability to make a salad without some cheese, some carbs and a warm factor too. I really love warm food, if you hadn’t noticed by now. This is probably why I love the start of fall so much, it means steaming hot and melty foods are perfectly acceptable again. Yes! I was really trying to wait a while to make this salad since I was not sure if everyone had pomegranates back in their stores yet, but I could not help it. It just sounded so good to me and I really wanted to break open the four pomegranates that I’ve had in my fridge for a couple of weeks. One I was excited to eat them, but two I was excited to photograph them. They are the most photogenic fall fruit. Those little pom arils are like jewels. I cannot get enough of them. My grocery store has had them in for at least a few weeks now, but maybe that is because I am closer to Cali. I am hoping you east coasters have them in now too. So this salad has a pretty Asian twist to it. 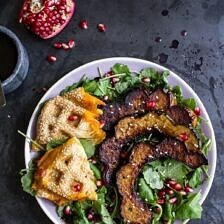 I have been wanting to use more miso ever since this noodle bowl, and acorn squash seemed like the perfect vessel to cover in a sweet maple + miso coating. It all sounded super delish when I said it in my head, so I have to say I was excited about this salad. The waffled grilled cheese was a complete after-thought. I was almost done prepping everything for the photos and stuff when I had this feeling that the salad was not hefty enough. It seemed a little boring with just roasted squash, pomegranates and dressing. And that is when it hit me that I kind of, no – most definitely, needed a grilled cheese on this salad. But not just cheese and bread. I really wanted it to play off the Asian flavors of the salad. SO in came the sesame seed bagel, cheddar apple and tahini grilled cheese. It’s pretty good if you just leave it at that, but then I had the thought to grill the sandwich in the waffle maker. YES, yes, YES! Not only is this super fun, but it’s actually beyond delicious and really easy too. The waffle maker just presses everything together like a Panini and really, I am just in love with it. Best last-minute decision ever. Seriously, you can’t skip the grilled cheese. Of course if you do not have a waffle maker, you can also use the stove, but if you do have a waffle maker, try waffling it. No seriously, waffle that grilled cheese. Just do it. Ok so what else, oh yeah the acorn squash. I am a huge fan of any kind of fall squash. Like I love them so much I secretly roast them all year-long. 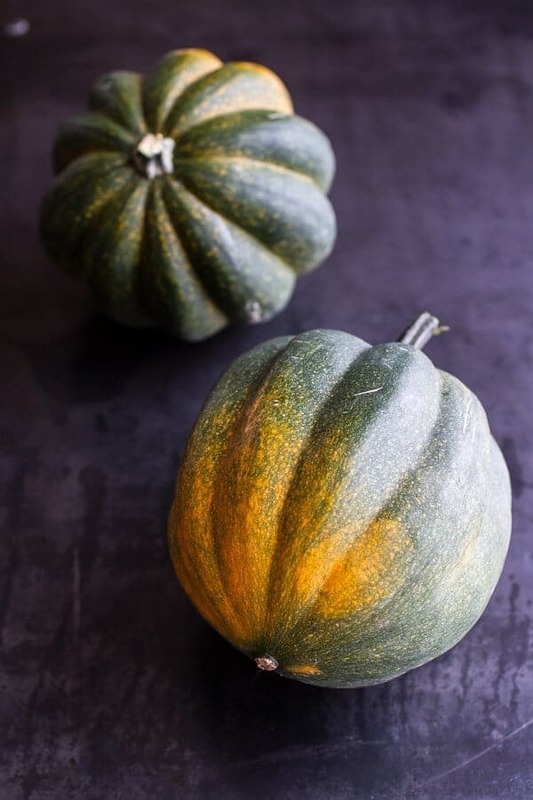 They are my favorite and I am so excited to overload you guys with squash recipes this fall. They’re gonna be good. The miso/maple mixture is delicious on this acorn squash. It’s such a perfect balance of sweet and savory and I love the Asian flavors too. For some reason I think they pair really well with acorn squash. And of course, the pomegranates are equally delicious. I have already gone through way too many pomegranates – and it’s only the first week of fall. I guess it is a good thing that they are soo good for you! For the dressing, I went with a super simple blend of reduced pomegranate juice, molasses and ginger. It may be a little odd but when it hits that baby kale, it’s perfection. Plus, it pairs well with all the flavors going on in the salad. All that green kale and pretty pomegranate arils cancel out the bread, butter and cheese, right? 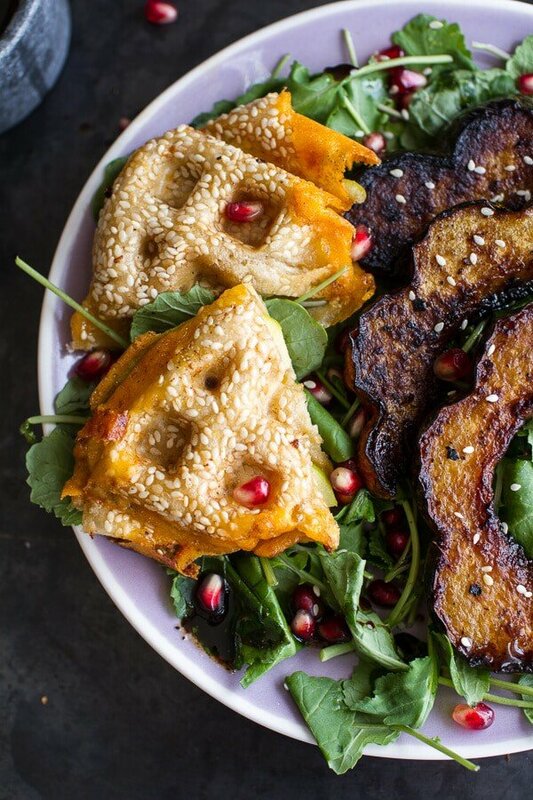 Miso Roasted Acorn Squash + Pomegranate Salad w/Waffled Cheddar Apple + Tahini Grilled Cheese Triangles. At first, I was not sure if miso and cheese would go together, but let me tell you, they do. And so deliciously well. 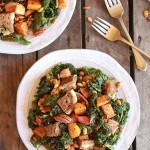 This salad may seem crazy from the title, and look simple from the pictures, but really it's a mix of both. In a large bowl whisk together the molasses, white miso, maple syrup and melted coconut oil, add a pinch of pepper. Next add the sliced acorn squash, toss well to coat. Spread the squash out in a single layer on a baking sheet. Roast until squash is tender and starting to caramelize, 35 to 45 minutes, flipping the squash halfway through cooking. Meanwhile make the dressing. Add the pomegranate juice to a small sauce pan and bring to a boil. Simmer for 15 minutes or until the juice is reduced to about 3/4 cup. Remove from the heat. Add the molasses, vinegar, sesame oil, hot chile sesame oil, fresh ginger, salt and pepper. Whisk to combine and taste, adjust to your liking. 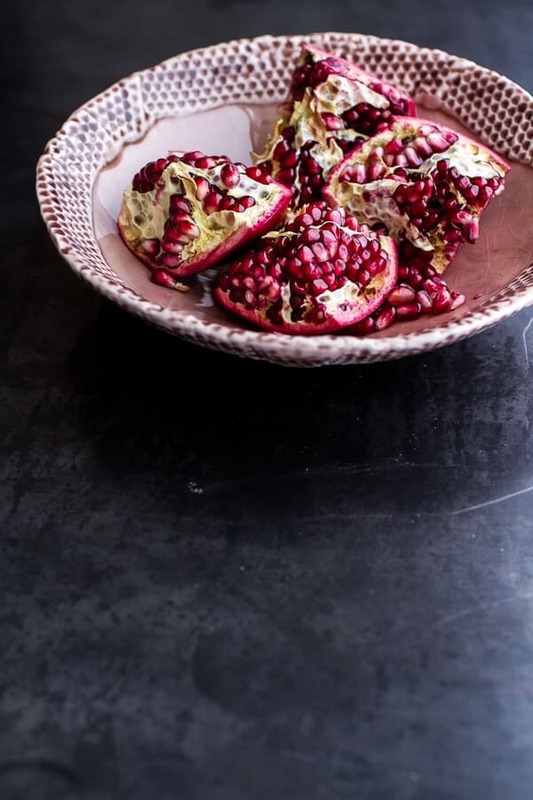 Stir in 1/4 cup pomegranate arils. Once the squash is done cooking, preheat your waffle maker to medium-low heat (or use a griddle/skillet). Butter the outside of you bagels. On the inside, add a slice of cheddar, a few slices of apples and a drizzle of tahini. Add another slice of cheddar and then the top half of the bagel. Repeat with the other bagel. Add one bagel at a time to the waffle maker, slowly pressing it down as it cooks. Cook about 2-3 minutes or until the bagel is lightly crisped. Repeat with the remaining bagel. Divide the kale among plates. 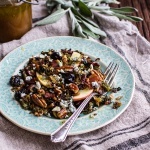 Sprinkle with remaining pomegranate arils and drizzle with the dressing. Add the roasted squash. Slice each bagel into quarters and place over top of the salad. Drizzle with more dressing if desired. Eat while warm! Well on this Thursday, they totally do. 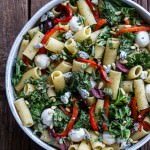 Simple Grilled Kale + Red Pepper Tuscan Pasta Salad. 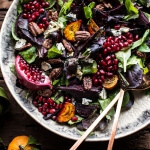 Winter Beet and Pomegranate Salad with Maple Candied Pecans + Balsamic Citrus Dressing. Pretty sure that this is about to become my favorite salad. Loving that waffled cheezy yumminess. Totally dying for this! 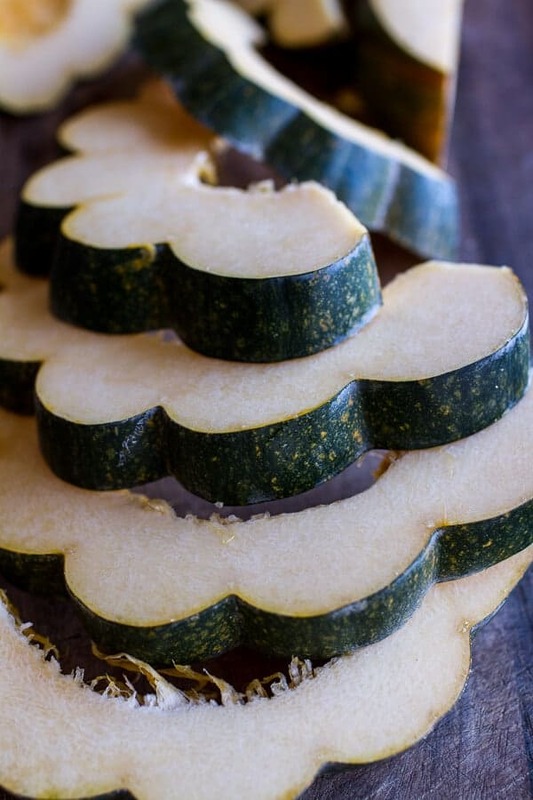 Love acorn squash. Absolutely obsessed with. But the combination of flavors here is really impressive. The pomegranate and sesame seed additions in particular is jarring my taste buds this morning. Lovely. Gahh, I need a waffle maker (only the billionth time I’ve said that). And your poms look perfect! They, I think, are just getting to the East Coast but don’t look nearly that good yet. Can’t wait for when they do. You need one!! And I hope those pomegranates start looking good soon! Salad without cheese should be a crime! 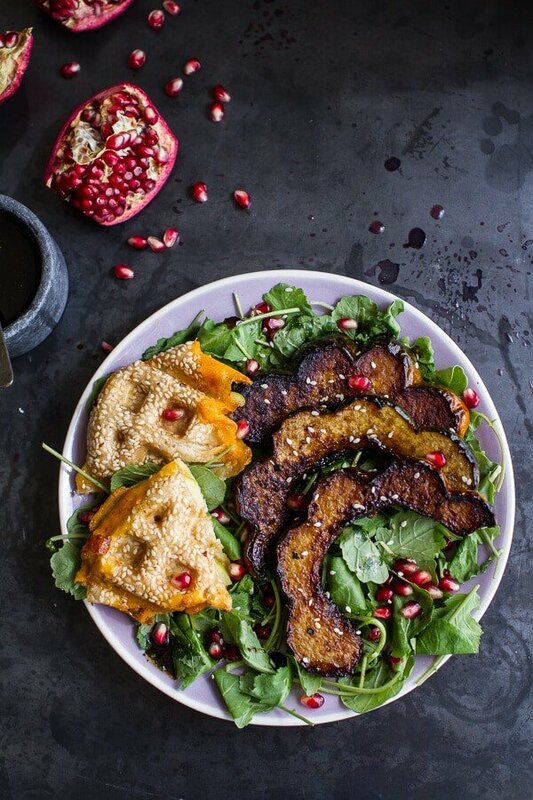 So I would have never thought of miso + acorn squash + pomegranate together! SO fall! I would have loved the salad as is, but obviously that grilled cheese takes it over the top! Heavenly! these flavors sound totally incredible together! 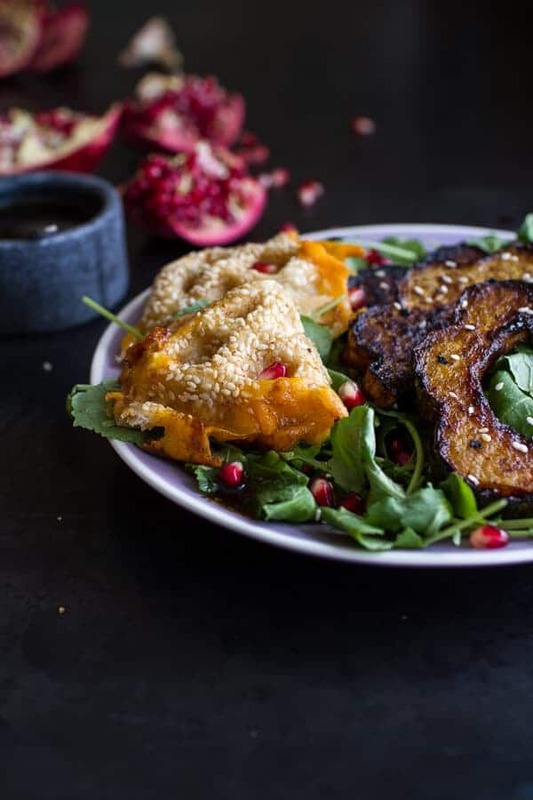 miso, squash, poms! and apple tahini grilled cheese!? you’re for sure killing it with this dish, tieghan! Awe! Thank you so much, Lindsey! I am so excited pomegranate is back in season! I was just about to photograph a dish using it! Also, I love the way you cut/cooked that acorn squash. It looks sooo good! This looks so fall-y and I love your titles, they always make me chuckle and drool! Salad + grilled cheese sounds like the perfect lunch to me. Love these fall flavors! Wow, your bagel waffles are sooo clever ! I’m in love with this idea. Thank you, Tieghan ! Love those anthro bowls 😉 I need to get my hands on the gray ones! Delicious-looking salad as well. I’ve been eying that pomegranate in my local store for quite some time. This is beautiful and makes me want to come have lunch with you. I love grilled cheese sandwiches and yours sounds great. 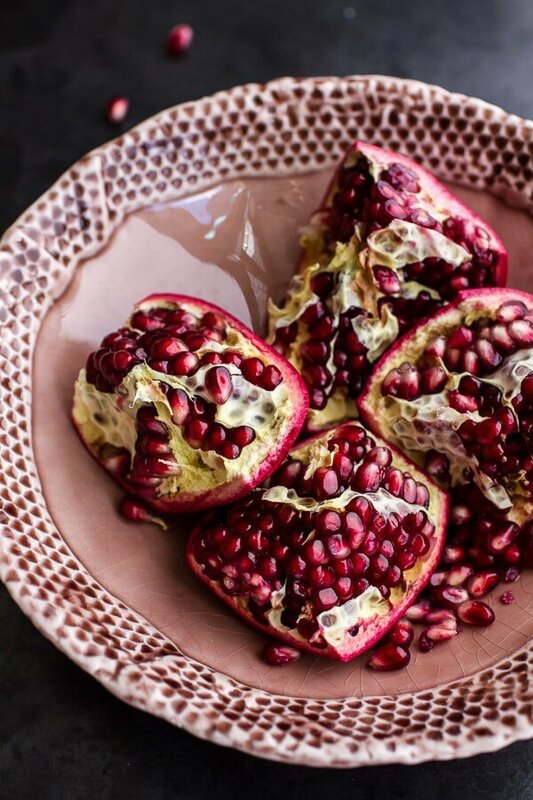 I’ve never had a pomegranate yet–I guess I should try one. 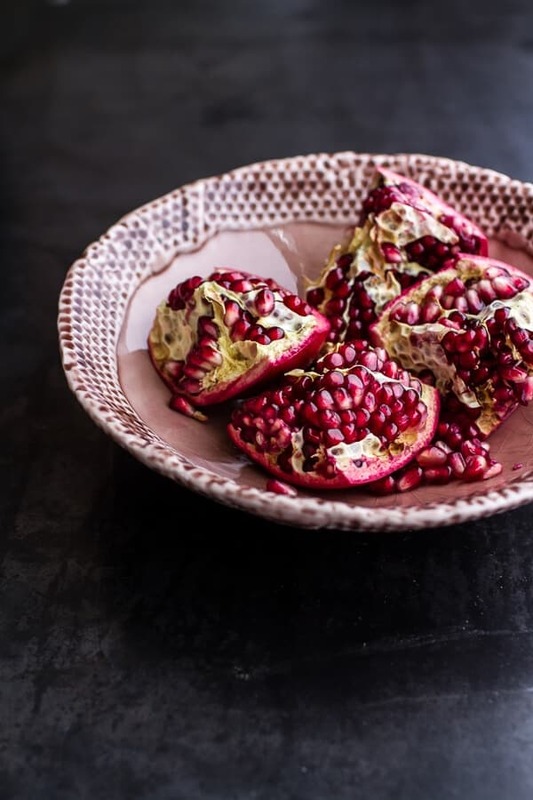 You have to try pomegranates arils. SO GOOD! Looks very unappetizing honestly. Trying way too hard to be “creative”. 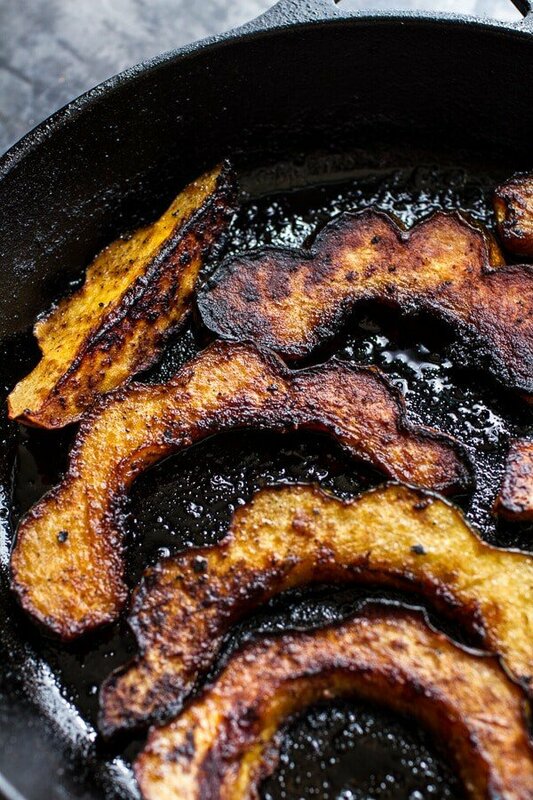 Love that you use tahini in this recipe. Love tahini and want to try it in more of my cooking, so this recipe is a must. Jelouse that you guys have pomegranate in stores, they have not arrived at our stores yet, can’t wait. And that grilled sandwich.. i drooled all over the screen! I love tahini. It is so good with so many things. Haha! Thank you! I cannot believe I am pinning christmas pins already! I never would’ve thought to make grilled cheese in a waffle maker. Super clever and pretty idea! I love grilled cheese with a side of salad (it makes the salad much lovelier, you’re right) and this combination seems perfect indeed! Thanks Tieghan! This is the salad of my dreams! Must have it noooow! Thanks Ashley! Hope you are enjoying the first weekend of fall! 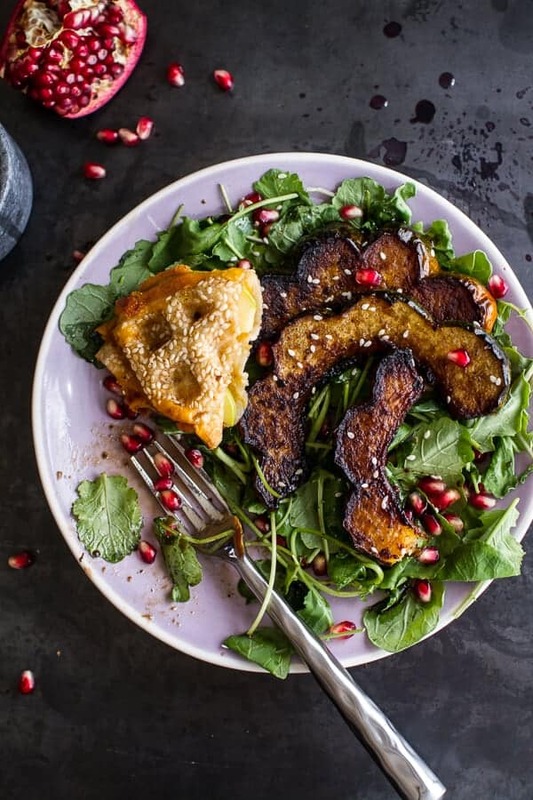 I never would have thought to put tahini on a grilled cheese, but that sounds amazing! Thanks so much, Johanna! Tahini is delish in this sammie! Tieghan, oh my gush, i just ate the entire bowl of that unbelievable salad. I meant to share with my hubby, but after initial bite i moved my plate away, put salad bowl in front of me and could not stop. UNBELIEVABLE!! 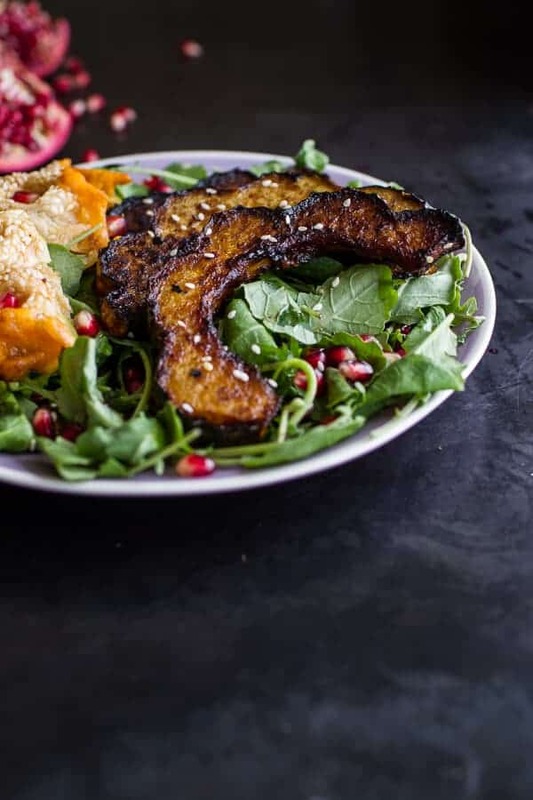 That pomegranate juice reduction dressing is just to die for, and pumpkin is such a good addition to that salad! I have already tried your glazed salmon last week, and it was really good as well, i am making that again. Do you have nutrition info for this recipe? Hi Nancy! I am working on adding it, but for now I do not. So sorry about this! I hope you still try this recipe!